Did My First Pop Culture Memory Make Me Who I Am Today? To be upfront, I don’t have answers to those questions but they’re fascinating to think about nonetheless. Most likely, this is just the first thing I remember, there’s no deeper meaning and it’s a coincidence. On the other hand, it seems plausible my mind remembers that back seat at the drive-in because I continued to go to the drive-in and other movie theaters to see movies throughout my life. It’s a happy place and, therefore, a happy memory. Less plausible, but still possible, is somehow this moment imprinted on me and ever since, I’ve been trying to recreate and live in it, hence my life choices. One clue towards all of this could be the fact this memory wasn’t always 100 percent clear. When I first started telling that story I would say the movie at the drive-in was E.T. The Extra-Terrestrial. E.T. just makes it a better story because that’s such a formative and popular movie. The truth, though, is I just remembered looking up at the screen, seeing stars and something big, grey, and circular moving through a dark space. It seemed possible that was the moon E.T. and Elliott fly past but the math didn’t work out. I was born in 1980, E.T. was released in 1982 and two seems a little early to have such a clear, distinct memory. 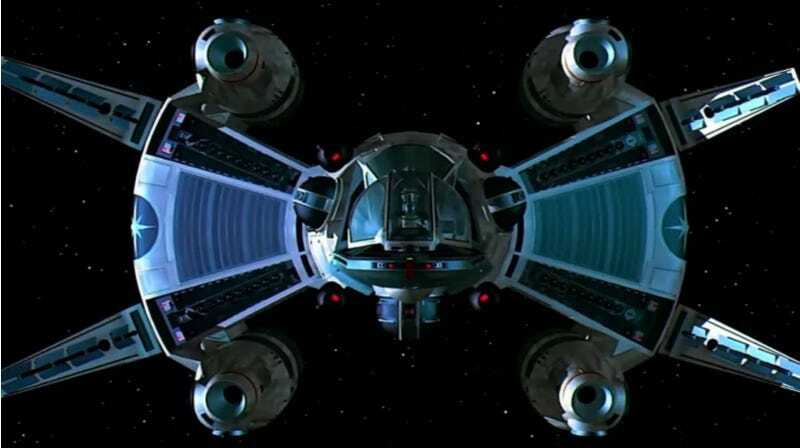 Later, somehow, I realized I was remembering a Gunstar ship from The Last Starfighter, and the timing of that movie made way more sense. I interpret that as my mind trying to mold the memory into something else. Trying to give it a logical origin. Which seems to suggest it’s malleable and that, maybe, I was shaping the memory more than it was shaping me. Plus, if the memory did shape me, how far could that go? If my first memory was at a concert, would I be a music writer? If I was at a stadium, would I be a sports writer? It seems a little silly to think fate factors in here. Basically, I don’t know what, if anything, any of this means, but here’s my guess. My mom tells me I watched Star Wars at two. I don’t remember that but it makes it seem clear a love of movies began at an early age. Then, this trip to the drive-in happened as my mind was beginning to store memories and it, along with everything else, kind of pushed me to this point. Popcorn, drive-ins and The Last Starfighter are just small, crucial building blocks of what I became today. But really, what do I know? I just write about movies for a living.